Downday’s debut single “Stuck At 17” is a song about high school sweethearts that against all odds fell for each other and stayed together. Upon listening you might pick up that Downday sounds like a rock station bleeding through a country one. As though the broadcast signal is weak from one station, so you hear strands of another fading in. You still mostly hear the country song, but now it’s been overlaid with a little harder rock. That’s Downday and that’s exactly the sound they were aiming for. Heavy guitars, country lyrics and a voice that straddles the divide between country and rock have garnered them attention in both genres. 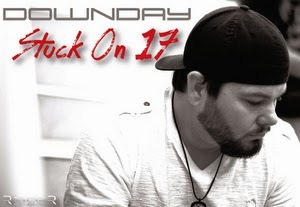 “Stuck at 17” is no different, the story they’ve spun is one that everyone from Tim Mcgraw to Taylor Swift has told but it’s presented with a rock melody; a deluge of drums and guitar bursting forth. He references old Facebook pictures and says “the girl I remember is closer than a memory” when she looks at him he’s transported back to those memories, “teenage girl and small-town Friday night” kisses and promises flying freely, high school love that no one would last. It did and he “Thanks God that every time I look at her, I’m still stuck at 17.” Downday’s currently staying in Oklahoma but you can catch them at the Cherokee Casino in Salisaw, Oklahoma, and keep an eye on their Facebook to see what tour dates they release!